The campaign follows the story of the vook "Day of the Dragon", by Richard A. Knaak. 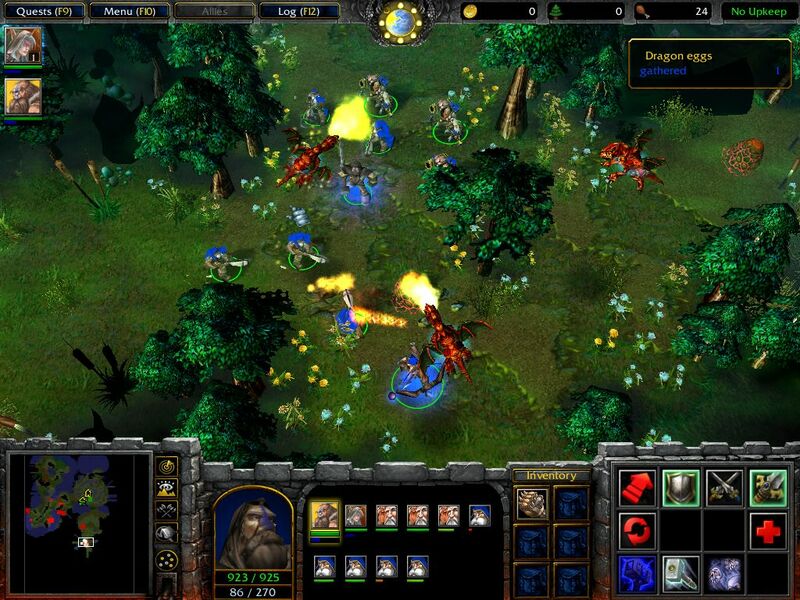 It's timeline is set between the Wc2-Addon and a few years before WC3. As with LotC I didn't follow the storyline exactly, due to the fact that it's impossible, if at least you want to have decent gameplay. It would have been better as a cinematic-series otherwise. 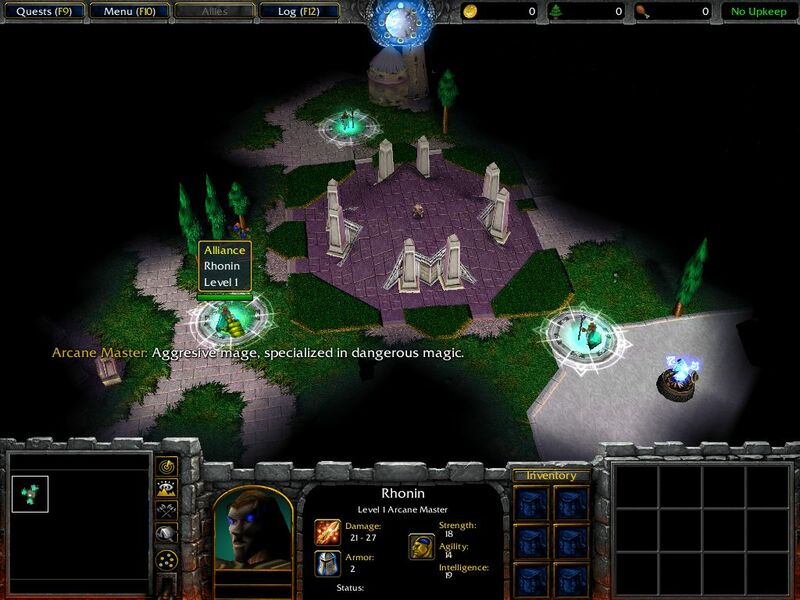 The campaign contains 15 maps. 8 normal. 3 you could call sub-maps. 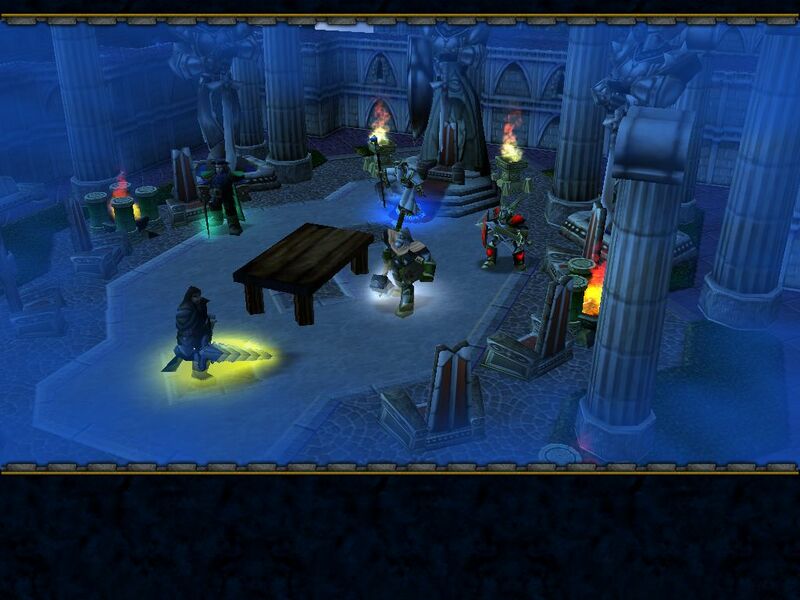 And 4 cinematic maps, one of which you will only be able to see if you complete all optional quests as a bad guy. There are more features to the cmapaign of course, but you'll have to see for yourself. Suffice to say that there's a lot of optional stuff. -Allgemein-Some texts maybe be too long or too short, depending on the time the stay on screen and the time you need to read. I tried to fix as many grammar as possible, but even I'm not perfect. -Chapter 1-The soldiers of the second optional quest may stay invulnerable after attacking the business man. -Chapter 2-The needed mortar team may die too soon. -Chapter 2-Units may stay unvilnerable after cinematics when they should not. -Chapter 2-The grutns at the end may irritate/block themselves. -Chapter 3-Units after cinematics may be owned by the wrong player. -Chapter 4-After saving/loading the game may not recognize certain Items anymore, and make further it impossible to continue. -Chapter 5-After saving/loading the game may not recognize certain Items anymore, and make further it impossible to continue. -Chapter 5-The AI in the Ysera-Level may look for your base without success. -Chapter 6-Problems with game balance. -Chapter 8-Trees and other doodads may be invisible. -Chapter 8-Ysera or Alexstrasza can't fly. -Chapter 8-Korialstrasz stays in air when changing back from Dragon Form. -Chapter 8-Alexstrasza casts spells without orders from the player. Please notify me about these, or any bugs you may find at the adress I wrote. -General-Read all dialogues and hints! -General-Each level hides a porweful artifact. -Chapter 1-The kid's cloak can help you in difficult situations. -Chapter 1-Buy items with gold. -Chapter 2-Divert the peons fromn the burrows with the Sleep Arrow or Khaz'goroth's Hammer. -Chapter 2-Let the ogers in peace and sneak by them. -Chapter 3-Don't damage Kryll too much. Just hit him once. -Chapter 3-Take care of the steam tanks. You need to put weight on the Switches. Direct frogs by throwing stones on them, and catch them with an net. Three frogs per switch are enough. Left from the switches is a barricade. Destroy that and continue that way. "Sell" stones you have to the fire pit (right click on a stone and left click on the fire pit). Book 1: Go to the "dangerous zone" from the north. Read Kryll's info. The sequence is: Red>Green>Blue. Book 2: Go to the peon. A lake that has the id card is to the south. Go north to the peon again. There is a destroyable tree. Behind that you can change the picture on the id card. Now you can go past the Bouncer. Talk to Volbir and Bolvir. The upper peon needs a mushroom. You will find it to the south (under the red-glowing switch). Der lower peons needs gold you can get from Volbir and Bolvir. The middle peon needs to be hit ((A)ttack). Meet Volbir and Bolvir again when all three peons work again.They will tell you that you can find on of the books at the ressurction stone (at the fire pit). Book 3: After getting the 1. book Kryll tells you to dig for the 3.. The shovel is to the north, right of the greedy peon. The map in the bookshelves informs you that the book you need is at Rhonin's starting position of the Level (X with stones and a tree). When you have all three books placed at their right bookshelves you can continue to the second island. Boat card: The Bouncer wants a fish. There's a lake to the north. A fish pops up every few seconds. You can get it with good timing. 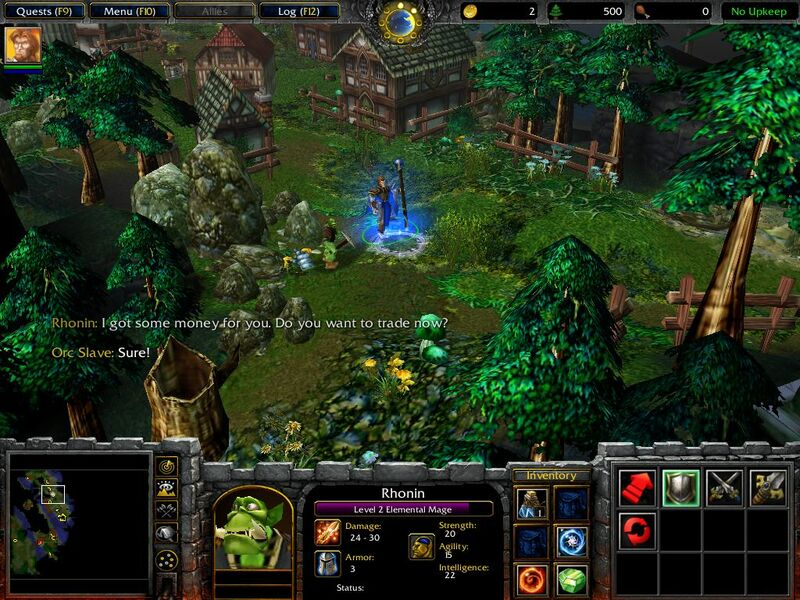 The Tinker needs to be far enough for you to get the lumber. When you have it you sell it (like the stones in the beginning) to the goblin hut. then talk to the tinker, then to your original employer. The vial: High in the north you'll find the Witch Doctor. Meet him. Go to his house (without a key), go again to him, then again to his house (with the key), then again to him. Then go back to the farmer. Hungry wolves: There's a pig to the left. You'll need to destroy the fence. Bring the pig to the wolves, then talk to the peons. Optional Quest: You'll have to ask the 12 different questions to the suspects (4 for each). You'll have to talk to the police officer. The Witnesses. Identify the murder weapon at the police-station. And go to the suspect's houses. They key to Cril's House is behind his house (move camera). Robo-Goblin: You should do this mission right after recieving it because the robo-goblin may walk away too far. It will have to follow the torches to the right, the end is not far. Stonerhine-Necklace: Talk to the peon in the middle. Go northwest to the witch doctor. Try to leave the place, talk again to the witch doctor. The gypsy's riddle's answer is "fish". Talk to the witch doctor, then to the peon in the midle again. Then return the mone to the original mission-giver. Tavern: The hop is to the west, behind a fence. The malt is to the east between corn. The missing son: He is under a canopy tree, in the central of the island. A mushroom-arrow on the groudn shows where. Bring him to his father. Then find a foot switch to the south that opens a secret passage. There you will get another Crysstal. When you have four xrystals you should visit the Gate Warden again. Go south to the rocks, then norzth to the goblin. Hit the vulture with a stone (from the rocks) when it gets vulnerable (avery time it is at its northern position). You should already have your first bloom. The other is to the west. The last is just before the destroyed farm (move the camera around when Kryll tells you to). give the blooms to the husbands. Talk to the goblin, give his note to the goblin in the east. Take the barrel and destroy the rocks. There's a farm after the switch-riddles, take the wheat you find there. Give it to the chickens and take their "poo". Put it at the boxes where the goblin-trader is. Visit Kryll, take the first leg. The second leg is northwest. Go west to the stone of ressurection. Then turn north, then south. Bring the two legs to the Goblin Miner. Go west after the cinematic and try to get to the zeppelin withou fighting. -Chapter 5-Get the three Items to activate the sub-maps. -Chapter 5-The needed items for the optioanl quests are in Krasus' room. -Chapter 6-Get gold from attacking orks. Build up an army before going to the next town. Leave a few units and a hero back at each base. 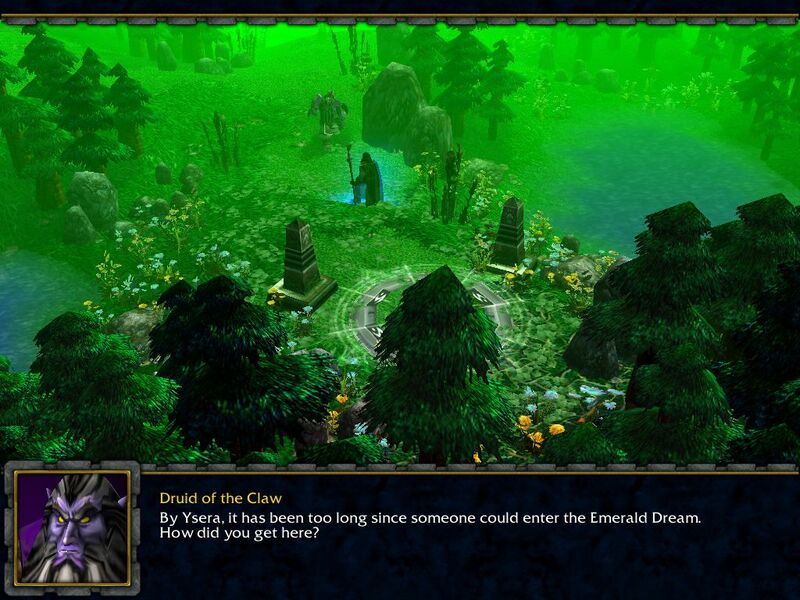 The optional quests provide more units/gold. -Chapter 7-Don't lose your units needlessly. Use Krasus' and Deathwing's Medallion as much as possible. 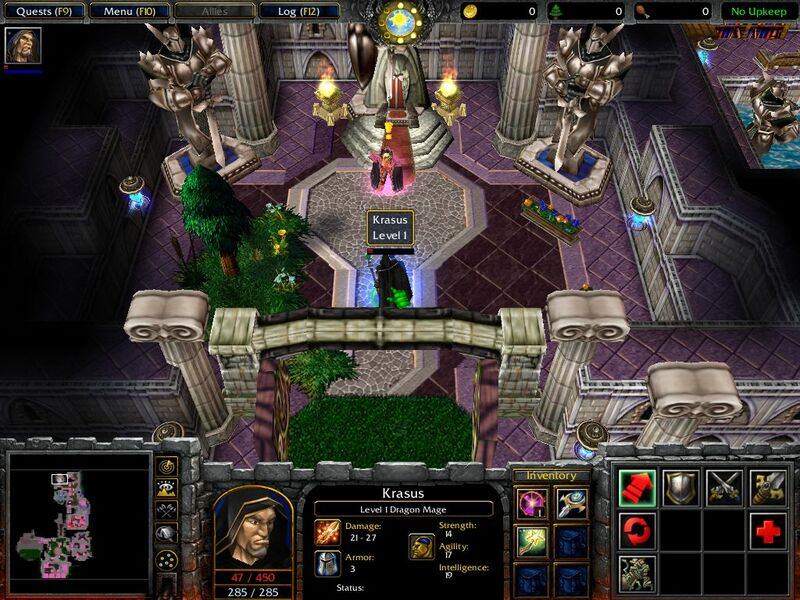 -Chapter 8-Protect the base with many towers. Protect those with tents and other buildings. Don't tck too fast, concentrate on building an army. Maximize your supply before attacking a base. -Chapter 8-Deathwing heals over time, so act quickly. Nozdormu's Steal-Item will help you heal you aspects. Alexstrasza will do that later. Malygos just has to provide enough mana. Sleep and Mindfrost are effective defensive measures. This campaign was created 95% by me (OutsiderXE. The rest is explained in the credits at the end of the epilogues. 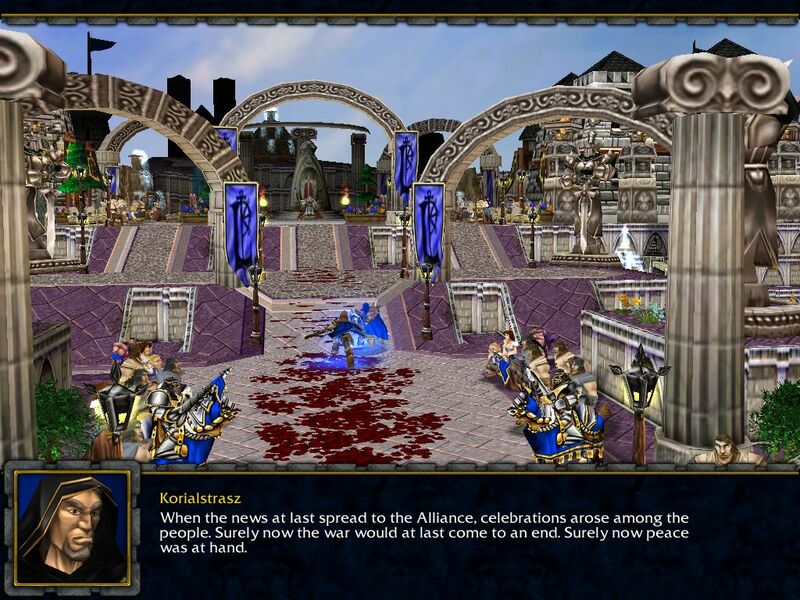 Special thanks again to Richard A. Knaak (he wrote this wonderful book), Rondo (most important models and skins), Lord-Bhaal aka Luthais (just because he insisted^^) and of course wc3sear.ch and Blizzard. And everybody who enjoys playing this campaign! This campaign can only be distributed with this Readme-Document. send complaints, praise, hints and information to outsiderxe [AT] web DOT de. As long as I am not on vacation or (again) in jail (joking^^... I'm never on vacation ;-D) I will answer every E-Mail on the next day. Die Kampagne erzÃ¤hlt die Geschichte des Buches "Der Tag des Drachen" nach, von Richard A. Knaak. 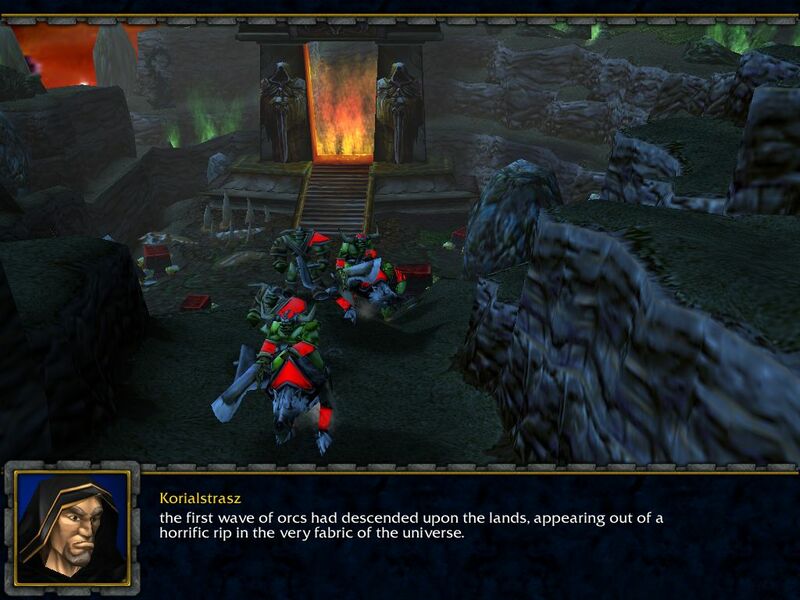 Zeitlich spielt die Kampagne kurz nach dem WC2-Addon, einige Jahre vor Warcraft 3 und erklÃ¤rt wie die Orks letztlich die Kontrolle Ã¼ber die Drachen verloren haben. Genau wie in LotC folge ich der Geschichte aber nicht 100%ig. Hier und da gibt es Abweichungen, als StÃ¼tze fÃ¼r das Gameplay. Weil sonst hÃ¤tte ich ja gleich eine Cinematic-Reihe daraus kreieren kÃ¶nnen. Die Kampagne besteht nun aus 15 Maps. 8 normale. 3 die man als Sub-Maps ansehen kann. Und 4 Cinematics. Wobei ein Cinematic nur sichtbar wird wenn man alle Optionalen Quests bÃ¶se abschlieÃ�t. Nach weiteren Features mÃ¼sst ihr schon selber ausschau halten, es sei nur so viel gesagt dass es viele Optionen im Verlauf der Kampagne geben wird. Es wird wohl auch diesmal welche geben, aber ich habe bis zum Schluss gekÃ¤mpft sie zu fixen. Es mag eine Patch-Version geben aber nur wenn Bugs bekannt werden die wirklich den Spielfluss hindern, doch ich hoffe natÃ¼rlich dass es nicht so weit kommen wird. Eventuelle Bug-Meldungen bitte an "outsiderxe [AT] web DOT de". -Allgemein-Manche Texte sind entweder zu lang oder zu kurz auf dem Bildschirm zu sehen so dass man beim Lesen Schwierigkeiten bekommen kann. Grammatikfehler wurden nach bestem Gewissen ausgeschaltet, jedoch kann man bei dieser Textmenge vielleicht doch was finden. Einen QA zu den englischen und deutschen Texten habe ich selber vorgenommen. -Kapitel 1-Die Soldaten der zweiten Optionalen Quest bleiben vielleicht unbesiegbar und feundlich wenn man den GeschÃ¤ftsmann angreift. -Kapitel 2-Das notwendige Mortar Team stirbt zu frÃ¼h. -Kapitel 2-Einheiten bleiben nach Videosequenzen unbesiegbar die nich unbesiegbar sein sollten. -Kapitel 2-Die Grunzer am Ende beim Pfad irritieren/blockieren. -Kapitel 3-Einheiten gehÃ¶ren nach Videosequenzen dem falschen Spieler. -Kapitel 4-Durch Speichern/Laden des Levels kann es ein dass das Programm manche GegenstÃ¤nde/Items nicht mehr erkennt und ein weiterspielen unmÃ¶glich macht. -Kapitel 5-Durch Speichern/Laden des Levels kann es ein dass das Programm manche GegenstÃ¤nde/Items nicht mehr erkennt und ein weiterspielen unmÃ¶glich macht. -Kapitel 5-Die AI im Ysera-Level sucht die Basis des Spielers erfolglos. -Kapitel 6-Ungereimtheiten in der Spielbalance. -Kapitel 8-BÃ¤ume und weitere Doodads sind unsichtbar. -Kapitel 8-Ysera oder Alexstrasza kÃ¶nnen nicht fliegen. -Kapitel 8-Korialstrasz bleibt in der Drachenform in der Luft hÃ¤ngen, beim ZurÃ¼ckverwandeln. -Kapitel 8-Alexstrasza zaubert selbststÃ¤ndig, ohne Eingreifne des Spielers. Bei Auftauchen irgendeines Bugs, auch der oben-genannten, bitte an oben genannter Adresse melden. -Allgemein-Alle Dialoge und Tipps lesen! -Allgemein-In jedem Level ist ein mÃ¤chtiges Artefakt versteckt. -Kapitel 1-Der Umhang vom Kind kann in brenzligen Situationen helfen. -Kapitel 1-Mit Gold GegenstÃ¤nde kaufen. -Kapitel 2-Peons aus den Burrows mit dem Schlafpfeil oder Khaz'goroth's Hammer ablenken. -Kapitel 2-Oger in Ruhe lassen und vorbeischleichen. -Kapitel 3-Kryll nicht zu oft schaden. Ein Schlag reicht. -Kapitel 3-Auf die Dampfpanzer aufpassen. Auf die FusÃ�schalter muss genug Gewicht. FrÃ¶sche mit Steinen "lenken" und auf den FuÃ�schaltern mit dem Netz einfangen. Es reichen drei FrÃ¶sche pro FuÃ�schalter. Links von den FuÃ�schaltern ist eine Barrikade. Diese zerstÃ¶ren und durchlaufen (Kamera drehen hilft). Steine die man noch im Inventar hat dann am Lagerfeuer "verkaufen" (Rechtsklick auf den Gegenstand, dann linksklick auf das Lagerfeuer). Buch 1: Von Norden auf's Buch das im "gefÃ¤hrlichen Ort" ist laufen. Kryll's Info lesen. Die Schalterreihenfolge ist Rot>GrÃ¼n>Blau. Buch 2: Zum Peon gehen. Nach SÃ¼den zum Teich gehen und den Ausweis holen. Wieder nach Norden zum Peon, in der nÃ¤he it ein zerstÃ¶rbarer Baum. Dahinter wird das Bild auf dem Ausweis ausgetauscht. DanachlÃ¤sst der TÃ¼rsteher einen vorbei. Mit Volbir und Bolvir sprechen. Der obere Peon braucht einen Pilz, dieser befindet sich im SÃ¼den (unter dem rot-leuchtenden Schalter). Der untere Peon braucht Gold, Volbir und Bolvor stellen es bereit. Der mittlere Peon braucht nur einen Schlag mit (A)ngriff. Wenn alle drei Peons arbeiten verraten Volbir und Bolvir dass ein gesuchtes Buch am Wiederbelebungs-Felsen (beim Lagerfeuer) ist. Buch 3: Nach Einsammeln des 1. Buchs verrÃ¤t Kryll dass man nach dem dritten Buch graben soll. Die Schaufel ist nÃ¶rdlich, rechts vom Gold-gierigen Peon. Die Karte aus den BÃ¼cherregalen verrÃ¤t dass man am Startort des Levels (X mit Steinen und einem Baum) graben soll. Wenn alle drei BÃ¼cher an den geigneten Stellen platziert wurden Ã¶ffnet sich der Weg zur zweiten Insel. Bootskarte: Der TÃ¼rsteher braucht Fisch. Etwsas im Norden ist ein kleiner Teich wo ein Fisch alle paar Sekunden auftaucht. Mit richtigem Timing bekommt man den Fisch. Der Tinker musss weit genug stehen damit das BÃ¼ndel Holz genommen werden kann. Dieses wird dann (wie die Steine zu beginn) an der Goblin-HÃ¼tte verkauft. Danach spricht man mit dem Tinker, und danach mit dem Auftraggeber. Das FlÃ¤schschen: Hoch im Norden findet man den Doktor. Danch besucht man sein Haus, ohne SchlÃ¼ssel. Danach wieder den Doktor. Danach wieder sein Haus, mit SchlÃ¼ssel. Danch wieder den Doktor, und am Ende den Farmer. Hungrige WÃ¶lfe: Gleich links ist ein Schwein. Um es zu bekommen muss der Zaun zerstÃ¶rt werden. Dann gibt man das Schwein den WÃ¶lfe und erzÃ¤hlt den Peons vom Erfolg. Optionale Quest: Insgesamt muss man den verdÃ¤chtigen 12 Fragen (jeweils 4) gestellt haben. Dazu muss man erst den Polizist nach allen Personen befragen. Das Werkzeug in der Polizei-Station Ã¼berprÃ¼fen. Alle Zeugen befragen. Und alle HÃ¤user der verdÃ¤chtigen untersuchen. Der SchlÃ¼ssel zu Cril's Haus ist hinter seinem Haus (Kamera drehen). Robo-Goblin: Es empfielht sich diese Aufgabe direkt nach Erhalt zu lÃ¶sen da der Robo-Goblin sonst zu weit weglaufen kÃ¶nnte. Der Robo-Goblin muss die Fackeln entlang gehauen werden. Rechts, nicht weit entfernt, ist das Ziel. Steinrhein Kette: Sprich mit dem Peon der sich in der mitte befindet. Gehe nordwestlich zum Hexendoktor. Beim Versuhc den Ort zu verlassen wird man aufgehalten. Spreche erneut mit dem Hexendoktor. Gehe dann sÃ¼dlich zum Zigeuner. Die Antwort ist "fisch". Spreche wieder mit dem Hexendoktor, danach mit dem Peon und am Ende mit dem ursprÃ¼nglichen HÃ¤ndler. Taverne: Der Hopfen ist im Westen. Ein zaun mus zerstÃ¶rt werden. Malz ist im Osten beim Korn. Der vermisste Sohn: Dieser befindet sich zentral auf der Insel, im Osten. Ein Pilzfpeil auf der Karte zeigt wo genau. Den Sohn brignt man dem Hexendoktor zurÃ¼ck. Danach geht man sÃ¼dlich und lÃ¤uft auf einen FuÃ�schalter der eine geheimen Zugang Ã¶ffnet (oben bei den BÃ¤umen). Dort bekommt man den nÃ¤chsten Kristall. Bei vier vorhandenen Kristallen besucht man erneut den TorwÃ¤chter. Man geht sÃ¼dlich zu den Felsen, dann nÃ¶rdlich zum Goblin. Den Bogel schieÃ�t man mit einem Stein ab (von den Felsen) wenn dieser besiegbar wird (immer wenn er mÃ¶glichst nÃ¶rdlich ist). Die erste Blume sollte man bereits eingsammelt haben. Die andere ist ganz im Westen. Eine weitere kurz vor der zerstÃ¶rten Farm (wenn Kryll sich kurz meldet). Man siet sie wenn man die Kamera dreht. Man Ã¼bergibt den Eheleuten ihre Blumen, spricht erneut mit dem Goblin, und Ã¼bergibt seine Notiz dem ursprÃ¼nglichen Goblin im Osten. Dann nimmt man das Fass und zerstÃ¶rt die Felsen. Nach dem SchalterrÃ¤tsel ist eine Farm, aus der nimmt man das Korn mit. man gibt es den HÃ¼hnern und nimmt ihre "Kacka". Diese platziert man bei den Kisten wo der Goblin-HÃ¤ndler ist. Danach besucht man Kryll und kriegt das erste Bein. Das zweite ist nordwestlich. Man geht dafÃ¼r am Goblin Bergarbeiter vorbei, bis zum Stein der Wiederbelebung. Dann nÃ¶rdlich und dann Ã¶stlich. Mit beiden Beinen besucht man den Goblin Bergarbeiter. Nach der Videosequenz geht man westlich, und versucht da Zeppelin zu erreichen ohne sich auf KÃ¤mpfe einzulassen. -Kapitel 5-Die 3 GegenstÃ¤nde abholen um damit die Submaps zu aktivieren. -Kapitel 5-Die nÃ¶tigen GegenstÃ¤nde fÃ¼r die Optionalen Quests sidn in Krasus' Zimmer. -Kapitel 6-Gold gibt's von den heranstÃ¼rmenden Orks. Man sollte seine Armee aufbauen bis das Supply-Limit der jeweiligen Basis erreicht wurde und bis auf einen Helden und ein paar Einheiten mit allem weiterziehen was man hat. Die Optionalen Quiests bietet mehr Gold/Einheiten. -Kapitel 7-Die eigenen Einheiten nicht unnÃ¶tig verheizen. Deathwing's und Krasus' Medsallion's so oft es geht einsetzen. -Kapitel 8-Die Basis mit genÃ¼gend TÃ¼rmen ausstatten und diese gut durch Zelte und ander GebÃ¤ude beschÃ¼tzen. Nicht zu schnell techen, lieber mehr EInheiten produzieren. Das Supply auf's maximum treiben bevor man eine Basis angreift. -Kapitel 8-Deathwing heilt sih mit der Zeit also nicht lange Ã¼berlegen. Nozdormu's Gegenstand-stehlen kann bei wenigen Lebenspunkten helfen. SpÃ¤ter Ã¼bernimmt Alexstrasza das Heilen. Malygos muss nur genÃ¼gend Mana zur VerfÃ¼gung stellen. Schlaf und Gehirnfrost sind effektive Verteidigungsmethoden. Die Kampagne wurde zu 95% von mir (OutsiderXE) erstellt. Die restlichen 5% sind in den Credits am Ende der beiden Epiloge beschrieben. Besonders danken mÃ¶che ich hier aber noch einmal Richard A. Knaak (er hat dieses groÃ�artige Buch geschrieben), Rondo (die meisten und wichtigsten Modelle und Skins), Lord-Bhaal aka Luthais (weil er drauf besteht^^), natÃ¼rlich wc3sear.ch und Blizzard. Und jedem der SpaÃ� beim Spielen dieser Kampagne hat! Diese Kampagen darf nur im Verbindung mit diesem Textfile weitergegeben werden. Beschwerden, Lob, Tipps und Informationen bitte an outsiderxe [AT] web DOT de schicken. Solange ich nicht im Urlaub oder (mal wieder) Knast bin (scherz^^... ich bin nie im Urlaub ;-D) beantworte ich jede E-Mail spÃ¤testens am darauffolgendem Tag.